(from a Nov. 13 report at CAMERA.org) — The New York Times often downplays Palestinian extremism or violence if the emphasis can’t be placed on Israel, Israeli counterattacks, or Israeli blame for ongoing violence. A case in point is the attention given to the escalating violence from the Gaza Strip. From start to finish, November 13th’s Times article about fighting between Hamas and Israel downplays the extent of Hamas violence while suggesting Israel is responsible for the group’s rocket attacks. or that the rockets it fires are indiscriminately lobbed toward Israeli civilians in their towns and cities in violation of international law. Twenty-four hours later, Israel appeared to be on the brink of just that [an unnecessary war]. But by what objective measure did the Times news reporter determine that a war, however unfortunate, would be “unnecessary”? Is the takeaway that it is unnecessary for Israel to gather intelligence on terrorists sworn to the country’s destruction? Or that it would it be unnecessary if Israel took military action to stop the rockets raining down on its citizens? Halbfinger doesn’t specify. He just editorializes, and does so in a way that casts Netanyahu leading the region toward an unnecessary war. While the opening of the piece frames the conflict as being Netanyahu’s responsibility, its closing paragraphs send a message of moral equivalence between Hamas’s indiscriminate rocket fire and Israeli counter strikes. There is no doubt civilians in Gaza and Israel alike are distressed by the explosions around them. And it’s reasonable for a reporter to document the fears of both Israelis and Palestinians. But it is [misleading] to describe Israel’s civilians as “caught up in the fighting” just the same as Gaza’s civilians. Unlike Israel, Hamas is targeting civilians, its imprecise crosshairs covering entire towns. Israel, in response, has targeted military and information assets of the terror group. So yes, Gaza’s civilians are “caught up” in the fighting around them. Israeli civilians, though, are targets of that fighting. The New York Times, with its misplaced “both sides” language, conceals that substantial and important difference, and it misses every other opportunity throughout the article to make the distinction clear. Readers are told “armed factions” (rather than internationally designated terror organizations) mounted a rocket barrage “across much of southern Israel,” and are left to guess whether those rockets targeted military installations or civilians. About Israeli strikes, by contrast, the author was precise with detail, noting that the country “hit scores of military posts and weapons caches across Gaza, but also leveled a Hamas television station, radio station and office building” — a “but” that suggests something there is questionable in Israel’s targeting decisions. 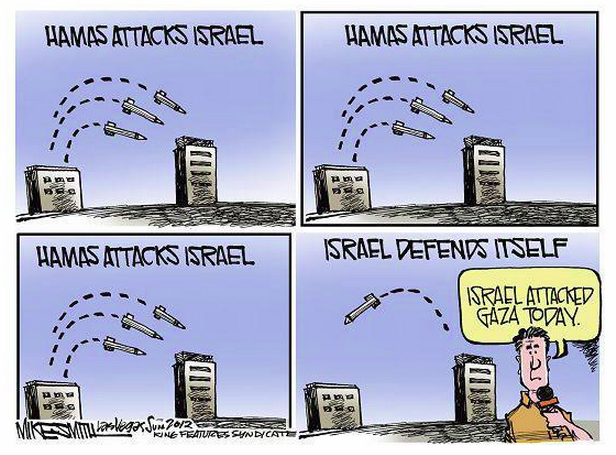 At what “in Israel” were Hamas rockets fired? The answer — at everything and anything — is concealed. Nor did the piece mention that those Palestinian groups named as targets of Israeli fire — Islamic Jihad and Popular Resistance Committees— are likewise viewed internationally as terror organizations. Why not? Perhaps because that gets in the way of the “both sides” framing. Not for the first time, the New York Times tells readers Israel responded with lethal force to mere “protests.” And as had previously been the case, that anti-Israel messaging conceals that the “protests” were accompanied by Palestinian violence — fatal sniper fire, the lobbing of IEDs and firebombs, the widespread destruction of Israeli agriculture, and violent efforts to infiltrate the border. That doesn’t not come as a surprise. Times editors have admitted they are comfortable describing [Palestinian] gunmen as “protesters.” And that’s exactly what’s required to write a piece about an onslaught of Hamas rockets lobbed at Israeli towns in which, outrageously, Israel is the one side of the conflict portrayed as targeting civilians. 1. What types of bias are illustrated in this analysis? 2. Why do you think the New York Times reports on the Israeli-Palestinian conflict this way? 1. Bias by spin (editorializing), labeling and omission.